Growing up Julia was always an artistic and creative person. Throughout school she focused mostly on fine arts, but never felt that it was quite her cup of tea. She wanted to be able to use that creativity to make something more practical. Crafts has become her outlet... allowing her to continue being creative without being so technical. The doors to crafting opened wide up for Julia Davidson when her boyfriend gave her a sewing machine (her proclaimed favorite tool) for her birthday. After spending about six months learning how to use it and perfecting her skills she discovered Etsy in a Readymade Magazine. 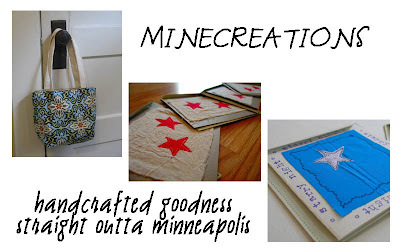 From there she started selling cards that she appliquéd fabric onto in her etsy shop minecreations. While Julia is somewhat of a newcomer to Minnesota, she is already feeling at home in Minneapolis where she enjoys the great community vibe and down to earth folks. Be sure to help support local artists like Julia! You can see more of Julia’s work at her etsy shop or see her goodies in person at I Like You and Crafty Planet (both in Minneapolis). And don’t forget to stop in and say hi at her blog!! Amanda has been artistically inclined all her life. She opened her Etsy shop Silver Dragon Rescue in March 2007 to help support her cause Silver Dragon Rescue, which is a no-kill animal rescue center she runs out of her own house. 100% of every purchase from her shop (except her mother-in-law's stuff) goes towards her animal rescue center. You can find out more about Silver Dragon Rescue here. Amanda’s current projects include hemp, monofilament fishing line and beads (glass, lampworking, plastic, clay, natural stones, etc. ), and paint. She is now trying out decorative birdhouses, and has discovered up-cycling. She will work with just about any medium. Her favorite tool is definitely her hands. She loves to make things by hand and takes great pride in her work which is very evident in her Natural blue Sodalite stone chip earrings, Orange Monarch Butterfly Necklace Bracelet and Earrings Set, and Sunflower Birdhouse. When she’s not crafting she’s a full-time mom to three small children (all under the age of 6). She enjoys playing with her kids and showing them how to make art of their own. You will find some of their creations here: Baby Onsies & ACEO Cards. She believes every experience can be a learning experience. Every question is answered and if she doesn’t have the answer, they look it up together. She truly loves being a mom. As stated before she runs a no-kill rescue from her home, so there are always things to do. 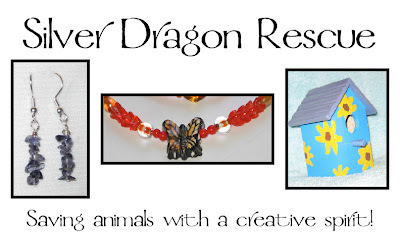 Check out Silver Dragon Rescue where you find her specially crafted creations. Lisa has been dreaming about starting Lil Fish Studios for 15 years and officially brought that dream to life in September 2006. She would ultimately like to continue to create, but would also like to create a venue in which she can represent the work of others as well as host classes with guest teachers and speakers. Lisa has been an Etsy member since last March and made the move from Chicago to Brainerd last October. She now lives on 10 wooded acres with lots of room to run and raise chickens, and hang out the wash. She says it’s a different sort of life compared to Chicago; quieter and beautiful. Lisa has yet to meet a power tool she didn’t like and a material she couldn’t physically manipulate. Her motivation for crafting is pretty simple. She HAS to. It’s her release that needs to come out and it does in her wonderful creations. She finds inspiration in the color, textures, and patterns it provides her and she’s moved to use as many recycled or re-purposed materials as possible in her craft work. Birds nests, ladybugs, leaves, and natural tones are all common in her work. You can find calm - turquoise eggs - birds nest pin, brown egg candle, and brick - original ACEO painting through her Etsy shop LilFishStudios. When Lisa isn’t working on her creations she’s chasing her boys, digging around for rocks, or taking her turkeys for walks in the woods! You may also find her cooking up some deep dish, looking at Etsy or blogging on her blog Lil Fish Studios News. 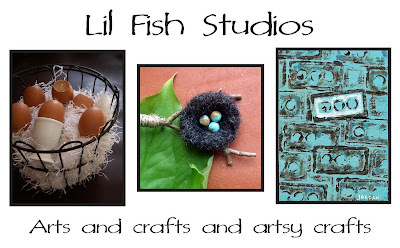 Check out Lil Fish Studios where you will find her one-of-a-kind creations. MirandaRanda is the lovely Miranda Andrews from Southern Minnesota. Miranda has a background in child development and it shines through in her work. Many of her items are activities for you to share with your kids. Puppets, collage kits, and fun soaps are some of the items she offers. Her soaps have fun surprises in them like rings and frogs to help children enjoy bath time. Don’t forget to get something for yourself too as she also offers some cool natural glycerin soaps for the kid at heart . 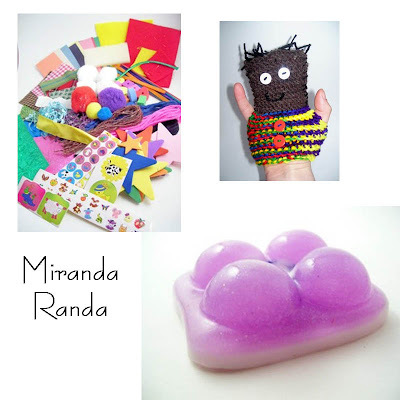 The first piece Miranda actually sold was a fiber arts sample to an art teacher in eighth grade. She was so excited that she would have given it away for free... but the lesson of placing a value on art was invaluable. Today Miranda sells mostly as a hobby, but would love if she could someday make a living from her craft.